I'm not opposed to this really. If they gave us a more interesting main cast (the kids weren't awful, but kind of dull, and the whole romantic sub-plot was a bit clunky), maybe even bring back some of the originals again, and give us more set-pieces like the final fight scene... it could actually be a lot of fun. Hell, use all that money to bring Sam Neil, Jeff Goldblum and whoever played Ellie Sattler back into the mix. Get some real chemistry in there (which, sadly, the raptor-whisperer and the workaholic just did not have). I'm completely fine with this. ...As long as they answer a bunch of questions that the ending of the first JW never got 'round to answering. *Do the kids' parents still go ahead with their divorce? *What becomes of the now evacuated park, with most - if not all, it's once captive dinos loose, once owner now dead, and the rest of the heads either dead or likely scarred for life? I agree with the rest of your list though. JW suffered a lot from being way too busy rather than having a focused narrative so hopefully they just focus on 1 thing in the sequel. Third highest grossing film in the industry's history. Of course there's a sequel. In fact, last I'd heard, it's already planned as a trilogy. And you know what? I'm okay with this. In fact, I'm overjoyed. Despite it being dumb in some respects, I loved the hell out of the film. It was fun, it was thrilling, it had some great, humorous dialog, and it gave me (most of) what I wanted and expected from it. So...yeah. Bring on the dinos. If Pratt's character is returning, and there's even a chance they'll tie the now-defunct park into the next story, they'd be dumb not to bring back Blue. She was essentially the 3rd pillar of the main protagonists. Other than that, will this sequel feel more like Jurassic Park 2, a smarter Jurassic World, or the Jurassic World equivalent to Jurassic Park 3? Are we really so soulless at this point? That even in a site dedicated to people that love these things, we go all business-like? 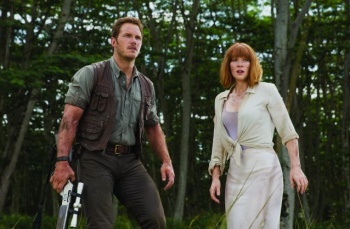 I like Jurassic World for all its faults so looking forward to a 2nd. Fingers crossed they drop the 15 rating, or at least up the gore factor by a lot. There just wasn't enough tourists eaten for my tastes (though that english chick got an uber brutal death that wouldn't have been out of place in an 18 cert...FFs she gets tossed around by air dinos, her limbs and bones probably breaking and snapping in the process, then gets eaten alive to either die of suffocation or of being digested? And this was a 15 cert death? Well gimme more of that please! ), and I really do dig the premise of a park full of yummy tourists caught up in a wave of freed dinos..Which sadly didn't happen for more then 5 mins in the film. Honestly? This was telegraphed in Jurassic World already. Which I honestly won't mind, I enjoyed said movie alot. Nah, its the same reason you won't see any of the MCU movies rated R or 18+, they have to make it available to as many people as possible to make as much money as possible. I just have to wonder how they're going to contrive a sequel to this. I mean I figured the park was pretty much dead after that disaster, from a business perspective I mean. Jurassic World was the worst Jurassic Park movie I've ever seen. I even liked numbers 2 and 3 for the record. Horrible looking dinosaurs, retarded dialogues, predictable plot and a complete lack of emotional investment into any of the characters. How anyone could praise it is beyond me. I never even felt excited to see any dino on-screen. Something which the original still does to this day. I'm hoping they do better with the next one. But I'm not holding my breath for it. I fully expect more CGI shitness.